- as you can see there are 16 k testnet coins on the pool wich missed the point to get shared to the addresses. - This might happen because of the 51 % defence system, wich rejects the block first and then make it good again afterwords. - But the pool does not recognize that the Block changed its status to good again . The Toad and me trying to find a solution, the problem is the pool software , not the client. Update your new client here. You can download this file and take the goldcoin-qt.exe file and place it in the folder from the previous version of the new client. If you run from this folder (after extracting), then you will have a completely new wallet! Update your new client here. Great, downloaded and running fine. Tested transactions between this and 0.7.5 client, no problem. The new custom 'zero-fee', although clear to me, will not be for individuals who do not understand some of the basics behind GoldCoin or Crypto in general. While I think it would be nice to 'cater' to every single person, I believe it is our job (as a community) to help explain the 'zero transaction' feature. Personally I would leave it be and ensure a basic help manual (1 page) was written to briefly describe feature in the wallet. Playing devils advocate as a 'new person', I could be frustrated by my transaction taking longer (based on the advertised benefits). This will happen when the network transactions pick up. However, until then I believe we are still making a good name for GoldCoin by illustrating zero transactions. 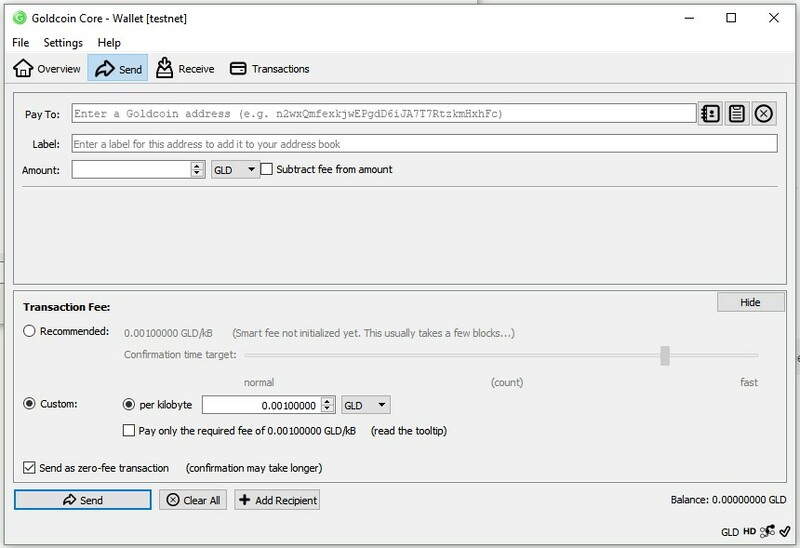 Would it make sense to relocate the "Send as zero fee transaction" box as shown, replacing the required fee box? Paying a zero fee is just fine as long as there is free transaction space available in the blocks. But be aware that this can end up in a never confirming transaction if the demand for free transactions has exceeded 5% of the block capacity. If we elect to go this route, we could just make .001 the minimum on the adjustable counter, since the only lower setting is zero anyway. This would force the user to choose between zero-fee via checkbox, or minimum or something higher via counter. Additional note: We probably want the zero-fee transaction box to be clear by default, and after each client restart. I think you will end up with a lot less headaches from user complaints (that their transaction didn't happen) as long as the user is forced to check the box for a free transaction. The location point is sort of moot, but others may disagree. The location isn't moot because it replaces a redundant line of operation within the client which then makes the custom settings less complex, easier to understand, and logical (while currently they are not). Eg. It's impossible for a "zero fee" and a "required fee" to exist simultaneously. - First time run popup warning to be smaller. - Pending balance having an estimated time until its available balance. - The word "label" to be replaced with "message" or "note"
- "Smart fee not initialized yet, This usually takes a few blocks...)"
- Remove the part from the "confirmation time target" with only the time, no block amount, the block amount doesnt matter to the casual user. These sentences create confusion and isn't important to the casual user, if you feel like having more information about that option replace the sentence with a simple "?" box where the user receives a popup where they can read more about that following option. Thanks for this feedback. We welcome pull requests for these changes! Pending Balance - the time is always 1 block or about 2 minutes. The word "label" is consistent with the Receive page and the File / Receiving addresses dialog. "message" is a different piece of information. Consider the following request made from the Receive page , which is based on BIP21. Message and Label are separate fields. What does the "Pay To:" field need to be symmetrical with? It currently has the same width as the Label field when considering the three buttons to its right. The recommended and custom boxes still have value because they will apply if the transaction size is greater than 1 KB as those values will be used as the transaction fee. Transactions > 1 kb cannot be free, under the default rules. Will the casual user click the "Choose..." button to get more control over the transaction fee? Most of these fields apply to a coin like bitcoin, which has a congested network. We could simply hide all these extra fields unless they have non-default values based on transaction history. The smart fee system looks at the recent block history and the fees for the transactions and comes up with estimates for confirmation times and fees. In our testnet and in the goldcoin mainnet, there aren't enough transactions to trigger this to show recommended fees other than 0.001. If the user wants a simple experience, then the "Hide" button works well. Granted that most of the options in the transaction fees section are redundant and not necessary for a coin with a low transaction volume. Keep in mind that changes (additions or deletions) to any words, sentences or phrases will require translation into the other languages and we don't have any translators or a system to get those translations. My preference is to change as little as possible, partially because my expertise with C++ is the protocol and not the user interface (QT). The Zero Fee function will only work if the Transaction size is less than 1 Kb (a default value that can be changed by the developers, if we want). If the size is larger than 1 kb, then the settings from the Required Fee or Recommended Fee will be used. That is why the original text said, Send as Zero Fee Transaction, if possible, as I copied this from another client. The "if possible" has to do with the constraint (< 1 kb), though that is not stated explicitly. Recommended Fee will be based on historical activity (low volume = 0.001, higher volume could be higher). My recommendation is that we hide all the extra sliders and text if the recommended fee for a fast transaction confirmation is the same as the Required Fee (0.001). Required Fee: 0.001 (the minimum allowed by the client, if paying a fee) <-- This could be hidden if the Recommended Fee is the same as the Required Fee, other wise we could show it. Send as Zero Fee: Will send as 0.000 fee, unless size > 1Kb, then uses the above fee. We could put a tool tip here regarding side effects of this. My recommendation is that we hide all the extra sliders and text if the recommended fee for a fast transaction confirmation is the same as the Required Fee (0.001). Yes. I think it makes sense to hide the custom settings by default. Right. But would this control configuration not cover every conceivable possibility since the default custom setting cannot currently be lowered below the required fee? I'm happy with having the settings either way. Just clarifying my thoughts from my previous post. Followed the instructions in the initial post regarding running version 2. Done. I launched the 2.start mining script and I have a box open saying "Mining: 0 Blocks Mined..."
it says slow... How slow? Grab a beer, hang out and watch something happen? Or go paint the house slow? ?